Finding out what makes your customers happy is the best way to ensure they become return customers. You can find out what they think and what makes them tick by using the customer service checklist template from Microsoft. The customer service checklist is a free template from Microsoft. You can download, save and print the customer service checklist by clicking the link available on this page. The customer service checklist is an easy to use, read and print Microsoft Word document. Any of the formatted items can be customized to better suit your business or company if necessary. At the top of the customer service checklist you can add your company logo. You can also add the company name, street address, city, state and zip code. The customer service checklist asks customers to take a moment to help improve the experience at your store. How often do you come to [Company Name]? How would you rate our [Type of Products]? How long did you wait for your order to be taken? How long did you wait for your product after ordering? Was the store clean and inviting? Below the body of the customer service checklist is a space reserved for additional comments the customer would like to make. 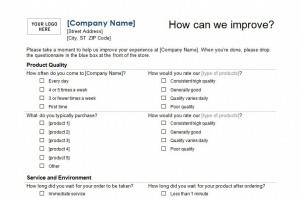 Lastly, the customer service checklist asks customers to add their name, address, phone number and email address. The customer can also note if they would like to be added to your mailing list. Learn what will make your customers happy with the customer service checklist. Download the free template from Microsoft today!